This past Friday began the Chinese lunar New Year of the Brown Earth Dog. I was born in a Dog year [many years ago], so I hope this will be an auspicious year for me and all of the other Dogs. According to the Chinese Horoscope, this year will be a busy one for Dogs and an exhausting one. It goes on to say that we Dogs need to take care of our health, get more exercise [ugh!] and drop bad habits [double ugh!]. I will do my best to make it a great year. Do you know your Chinese astrological animal sign? You can google it and look for your year listed with one of the twelve animal signs. Your animal year will repeat every twelve years. Now that I have completed the auction dog rug and have mailed it off to its rightful owner, I am busily finishing up a super secret rug, which I cannot show you. 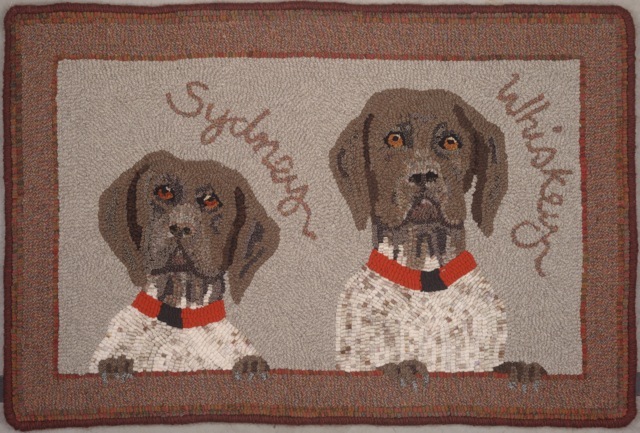 So, this week I will share a few hooked dog rugs that I have done. Do stop back next Monday when I will be doing a BOOK GIVEAWAY! I love doing them and you seem to like them, too. I know you will want to win this latest book from Ampry Publishing LLC and Rug Hooking Magazine. There’s a lot of beauty out there and in being a Dog, whether an astrological sign or an actual one. This is Ikey. He's 13 now and has diabetes, but he's doing great! This is Benji, who modeled for my Hutchinson-style rug a few years ago. This is Thumper [l.] and Beans [r.]. This is a topper for an antique trunk at the foot of our bed. It provides a launching pad for the doggies to get onto the bed. 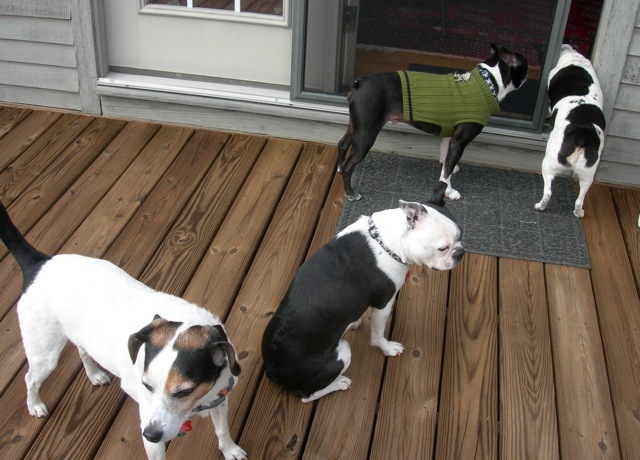 I think this is the only photo of all four of our dogs in one spot. I have admitted in the past to being a reluctant wool dyer, and that’s the truth. Now that I have hooked the dogs’ heads, necks, and collars, it’s on to their spotted chests. That will require some spot dyed wool. I pre-soaked some natural wool and accordion-folded it in a casserole pan. I put citric acid into the hot water in the pan, so the dye would go into the wool quickly and not spread out too much. I made up some chestnut dye and sprinkled it here and there on the wool. Into the oven it went for half an hour, then a cool down and a rinse and dry. It looked promising, but the test will be when I cut a few strips and hook some loops. Fingers crossed! The spot dyed dog-spot wool works. I am using a wider #8 cut, so the spots will appear larger, and I’m happy with the look it gives. 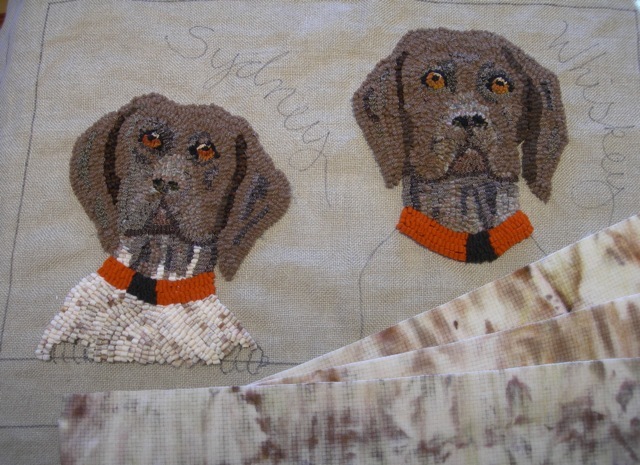 As soon as I hook Whiskey’s chest and all four paws, it’s on to the background and the hooked frame border. Colors to be determined. I like to see a piece evolve and emerge as I hook along. One thing leads to another. There’s a lot of beauty out there and in the unfolding of one’s artistic vision. Spot dyed wool makes dog spots.